Another one I used to sort out at Speke Junction, 6L48 is car empties from Fords compound at Garston back to Dagenham Dock. Its return empties of imported Ford cars and vans. The loco has been recently been put back in service by GBRf after many years out of action. It seemingly still hasn't settled down following its overhaul, indeed it had to be rescued in the very recent past when it failed, and it's not yet earnt its stripes such that it's let out on it's own. 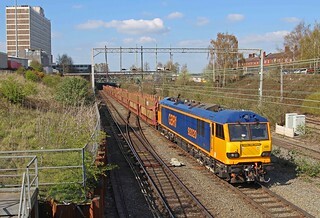 In recent weeks the loco has been accompanied by a class 66 on the pointy end acting as insurance. Whilst the 92 is providing the power In this shot what you can't see is that 66760 is hanging on the back of this lengthy train. 92020 leads 6L48 the 14.08 Garston Car Terminal to Wembley (truncated on this date) with 66760 out of shot hanging on the rear of the consist. Due to pass Salop Goods Junction at 15.26, the working is seen running 9 early at 15.17 on Saturday 6th April 2019.